Punyalan Agarbattis malayalam movie preview, story, first look poster, cast and crew are given here. Written and directed by Ranith Sankar will have Jayasurya, Nyala Usha Aju Varghese, and Rachana Narayanankutty donning important roles. The movie is produced by Jayasurya and Ranjith Sankar under the banner of Dreams N Beyond. With Bijibal as the music composer, the movie will be blessed with the presence of Sujith Vasudev as the cinematographer. Read more to know about Punyalan Agarbattis. Ranjith Sankar who made his entry as director with 'Passenger' is gearing up for his new venture titled 'Punyalan Agarbattis'. To be produced jointly by Jayasurya and Ranjith Sankar under the banner of Dreams N Beyond, the movie will be blessed with the presence of Jayasurya, Nyala Usha Aju Varghese, and Rachana Narayanankutty donning important roles. 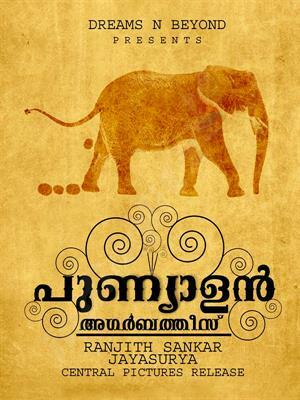 Ranjith Sankar who had earlier announced two projects Sudhi Valmeekam with Prithviraj Sukumaran and May Flower has thought of moving forward with 'Punyalan Agarbattis'. Ranjith who has already made name by directing movies like Arjunan Sakshi and Molly Aunty Rocks is ready with an interesting theme. 'Punyalan Agarbattis' story which develops around the backdrops of Thrissur, revolves around the life of Joy Thakkolkkaran(Jayasurya), an aspirant entrepreneur from Thrissur. Nyla Usha who plays the role of his wife is a new generation women who works in the telecom sector. The movie will have an interesting story line which is creamed with humour. Nyla Usha, a Dubai based radio jockey who had made her acting debut with National award winning filmmaker Salim Ahamed is thrilled to work with her next project. Rachana Narayankutty who had won the hearts of millions with his unique acting skill would don a prominent role in the movie. Aju Varghese who has created his own space in the malayalam film industry would give life to an important character who would tickle the funny bones of the viewers. Veteran actor Innocent who had made a second comeback with Geetanjali is playing the role of the hero's grandfather in 'Punyalan Agarbattis'. Scripted by Ranjith Sankar, the screenplay of the movie is handled by Ranjith Sankar,Anil Kurian and Abhayakumar. For the lyrics of Sathosh Varma, the tunes are set by Bijibal. The movie will have Sujith Vasudev as the cinematographer. The poster designs are set by Arun Chandu who has made name with the work of Vineeth Sreenivansan's 'Thattathin Marayathu'. The first look poster of in 'Punyalan Agarbattis' has already caught the eyes of the movie enthusiasts. Much interestingly, actor Jayasurya would lend his voice for a song in the movie.